For more than 50 years Fr. Fournier has shuttled to and from Switzerland, raising funds for early years education. 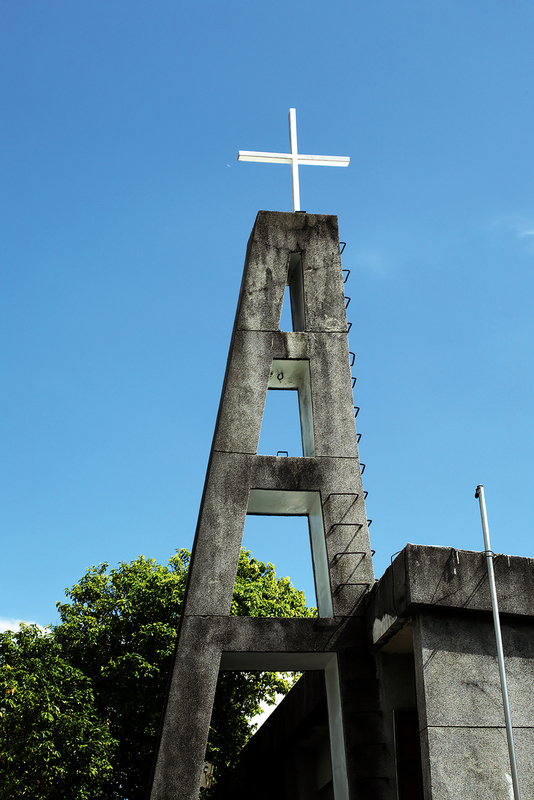 The spire of St. Joseph’s Church in Xincheng, Hualien County. Sacred objects used by Fr. Fournier when he performs mass beyond the walls of his church. Sunlight illuminates a statue of the Madonna and Child, adding to the sense of peace and tranquility in the church. 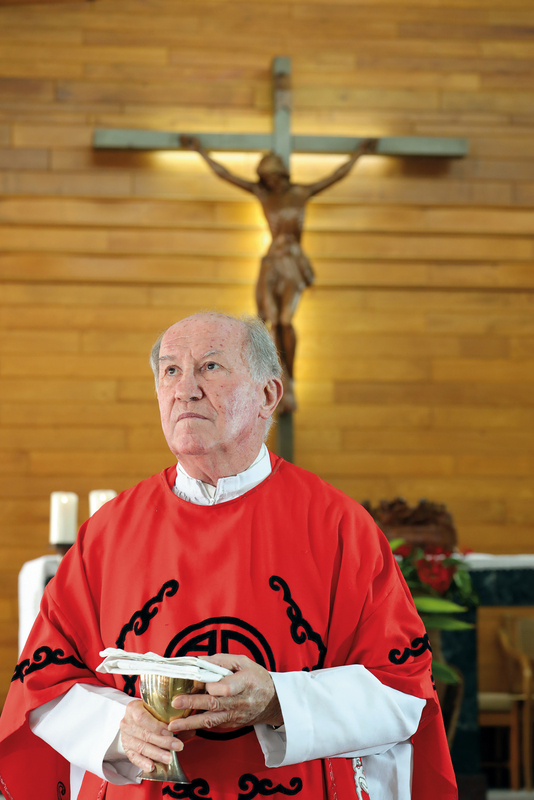 Whether they are members of his church or not, wherever Father Jean-Claude Fournier goes people welcome him, because his simple, un­osten­tatious and natural warmth accompanies local people through the countless vagaries of life. In the priest’s person there is no trace of pomposity. His life has been made up of countless acts of unselfish companionship and service. His extraordinary yet seemingly ordinary life has linked people inseparably to one another and to God, epitomizing the spirit of “helping people over the mountains” of the Congregation of Great St. Bernard. Fournier, born in 1938, is the son of a carpenter. His mother made clothes by hand at home. 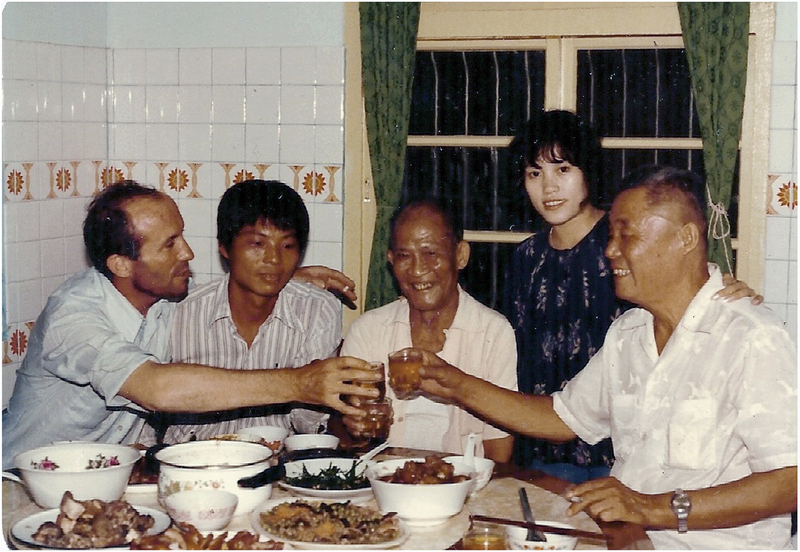 He recalls her often recounting the missionary exploits in China of his uncle, Fr. François Fournier, which had an influence on him. In his young heart, the seeds of piety were planted early. Later, Fournier went to study at a church school in Lausanne. A priest friend of his uncle came to ask him if he wished to follow his uncle’s vocation by becoming a priest and going to work as a missionary in China. “At the time, there were many paths I could have taken, including marriage,” says Fournier. But the seeds planted in his heart at a young age began to germinate at this time. Whether it was his uncle, his mother, or the ­assistance of his uncle’s friend that influenced his ambition to become a priest, ultimately it was through the people closest to him that God led him to the priestly path. 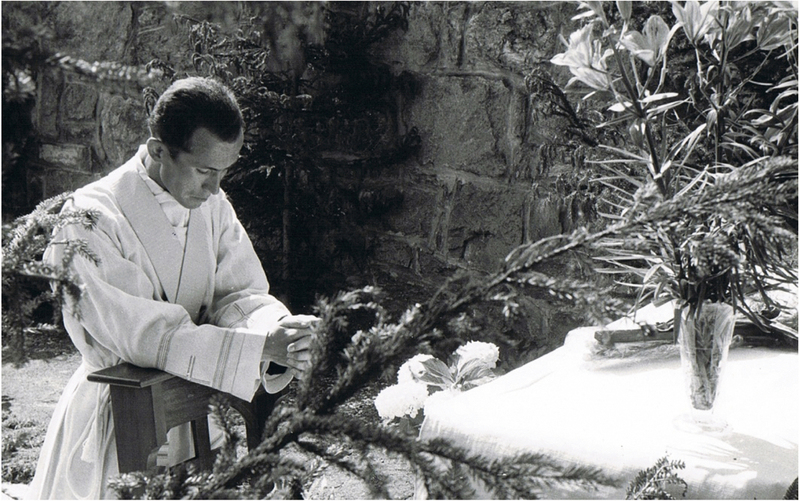 “To join our congregation you must first write to its head for approval.” In 1958, at the age of 20, Fournier entered the Congregation of Canons Regular at Great St. Bernard. This congregation was named after the hospice built in the 11th century by St. Bernard of Montjoux at the Great St. Bernard Pass to help travelers who faced the dangers of avalanches and brigands when taking this high Alpine route. Just after Fournier arrived at the hospice there was an ava­lanche, which blocked off the road by which he had come. 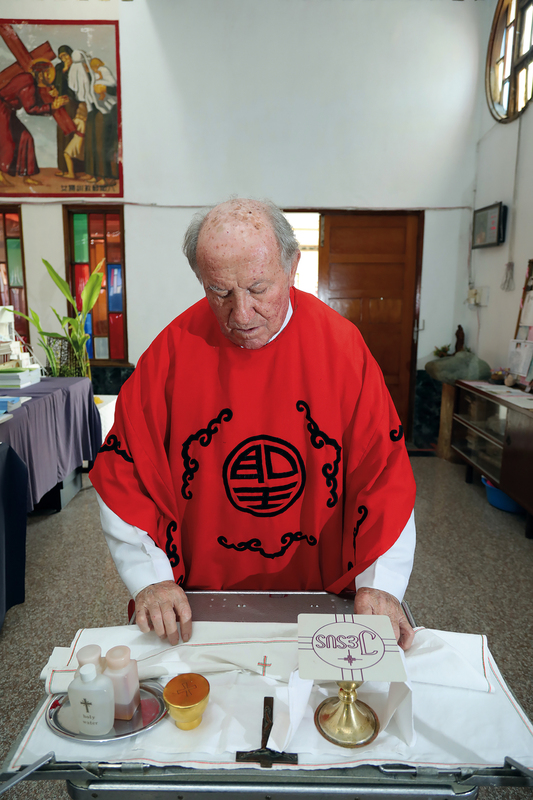 Who would have thought that thanks to this sanctuary once again fulfilling its mission of rescue and refuge more than 900 years after its founding, the priest Jean-Claude Fournier would one day be able come to the Church of St. Joseph in Hua­lien County’s Xin­cheng Township? In the face of a changing situation in mainland China, in 1952 the St. Bernard congregation withdrew its missionaries from Yun­nan Province. 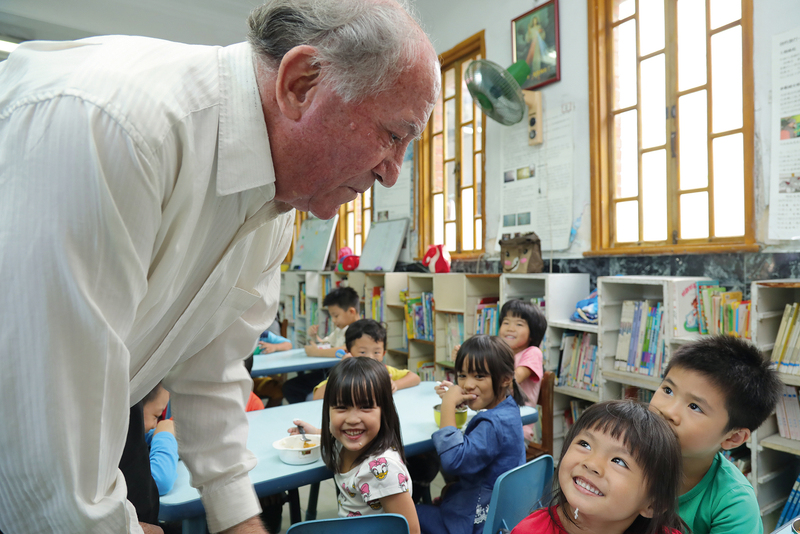 “In 1965, the first time I came to Taiwan, my uncle was also here.” Initially Fournier studied Chinese at the Jesuit college in Hsin­chu. Later, the apostolic administrator of the Hua­lien diocese, the Most Reverend André-Jean Vérineux, needed additional priests and successively summoned eight, including Fournier, to Hua­lien. The first problem Fournier encountered living in this alien place was that of language. “When I came to Hua­lien, I couldn’t communicate in Chinese, so I went back to school to study the language again. It was only later that I gradually gained the confidence to speak,” says Fournier. Apart from the language barrier, his missionary work was also subject to many restrictions. It was not possible to enter Jia­min Village in Xiu­lin Township, for example, without a mountain access permit, and certain coastal districts were also subject to controls. 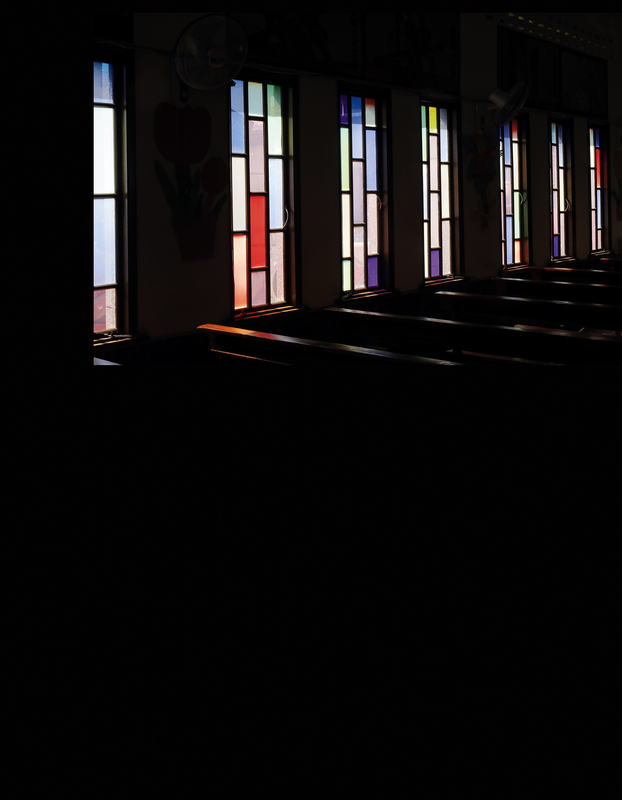 “­Every Sunday or Wednesday, we priests in Hua­lien would gather together in Xin­cheng.” Their discussions at those gatherings mostly centered on how to bring God’s love to the population and how to help the local residents. At that time the local indigenous people had no concept of saving. Sometimes they had no one to turn to if they needed to purchase farm implements or for help in emergencies. So Fournier and his uncle François launched a savings cooperative, encouraging them to save a little money every month—at least a few tens of NT dollars. The main purpose, apart from providing relief to poor and vulnerable residents, was to introduce people to concepts of money management. During this past 50 some years, countless people have thanked the priest. Some bring a bottle of wine to share with him. Others offer thanks in the form of produce from their own farms or gardens. To Fournier, this kind of person-to-person assistance and camaraderie is nothing less than a concrete manifestation of God’s practice of universal love. In the early days in Xin­cheng’s ­Jiali Village, the adults would go to work in the fields and the children would go to the church in the village to listen to the priest tell stories; gradually, all the children in the village would assemble in the church. In those years of poverty, building a kindergarten on the one hand was a way to care for the children, and on the other, the missionaries hoped, would help the seeds of faith to take root in the children in their infancy. “At the most there were 200 children here.” As he mentions the children of the kindergarten, Fournier’s eyes are radiant with affection. In fact, this journey has been anything but easy. In order for vulnerable children to enjoy the right to education, for more than 50 years Fournier has shuttled constantly to and from Switzerland, raising funds to pay for their teaching. In the early days the teachers were drawn from among the nuns of the nearby St. Martha Institute. Nowadays, professors of early childhood education from National Tai­tung University are invited to attend every month to provide training for the teachers. At the kindergarten, children are taught to love other people, respect God, and practice filial piety towards their parents. Alumni of Beide Kindergarten have gone on to serve as village mayors, local legislators and teachers. 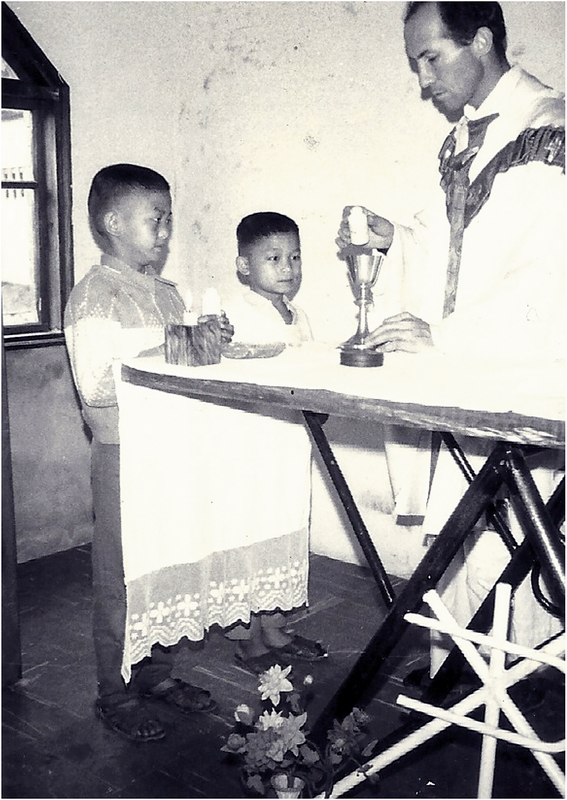 After success in their careers they often return to call on the priest and take part in church activities. As he speaks of the Fr. Jean-Claude Fournier he knows, the eyes of Sun Pan—head of Beide Kindergarten for 13 years—redden as he says with great affection, “Fr. Fournier came to Taiwan from abroad and has devoted many decades to service here. It’s very touching. This is why we all want to stay here to help him.” Through Fournier, God’s love is disseminated into every heart. Those who are touched by it reciprocate with love for everyone they meet and in everything they do. As we visit Fournier’s rooms on the day of our interview, although there is not much space, the vestiges of a lifetime’s missionary work, keepsakes, old photos, old radios, and so on are spread throughout the study, already quite small enough. As we enter the bedroom, apart from the narrow single bed, at the side we see a small washroom and toilet. Frankly, the space is cramped, but he endures hardship gladly. We listen to church members beside us discussing the priest’s belt and how, for decades, kept repairing it rather than buy a new one. Also, many of the tables and chairs in the church are recycled. “Don’t forget the way back home.” This is an admonition with which Fournier often exhorts church members. He never forces his religion on people, but appeals to his neighbors through the example of daily life. 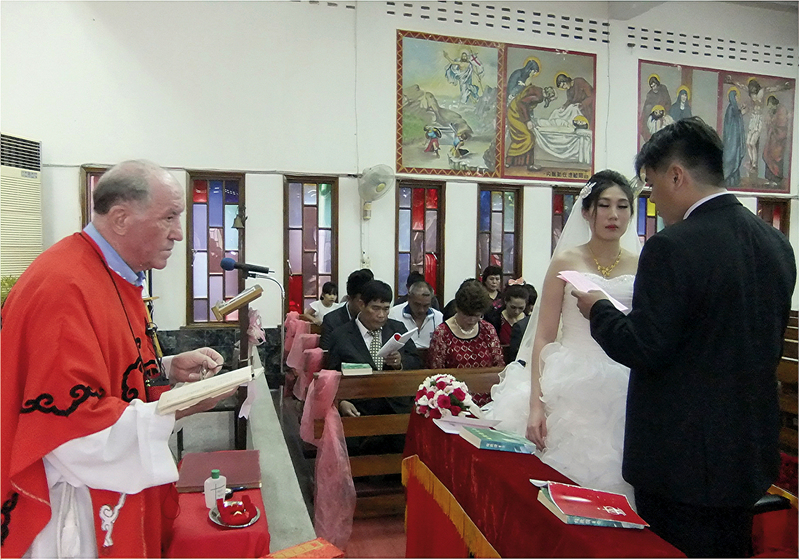 Fournier fears that this kind of simple and unadorned missionary style, also displayed in the ceremony of the mass, may not be understood by indigenous church members when the gospel is delivered in Chinese, so he has someone stand next to him to repeat it in the Amis language, enabling all those who attend the mass to receive and share in God’s love. If a church member is ill or passes away, Fournier will go to the family members’ homes every day to deliver mass. Accompanying them in mass and prayers in this way truly touches the relatives. “Without Jesus, there is no escape. When somebody dies or is taken ill and we go to pray, it is in order quickly to bring them God’s love. In this way they will surely come to happiness.” Because of God, Fournier’s desire to care for the poor or sick never rests. In recent years Fr. Fournier has never rested, workdays and holidays alike, still going everywhere to spread the gospel. The Congregation of Great St. Bernard has existed for nearly a thousand years. 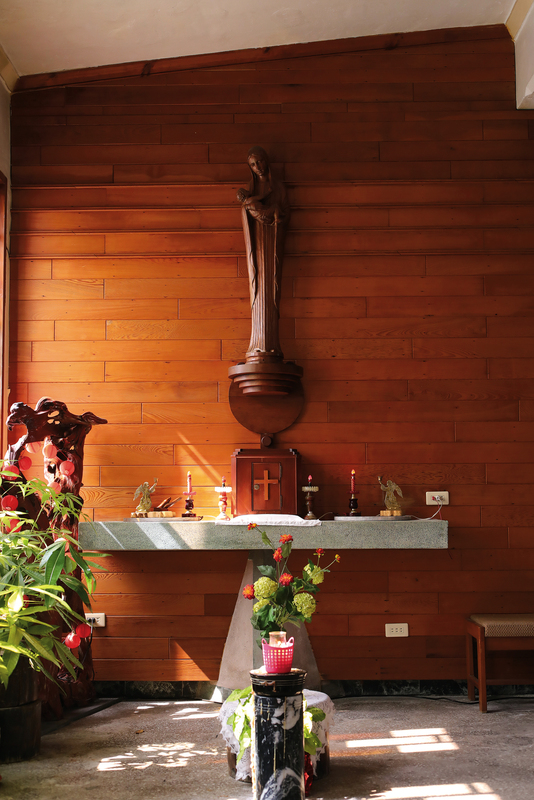 Its spirit of caring for travelers, exemplified by the hospice built by St. Bernard of Mont­joux, will continue to be transmitted by one generation of priests after another.